In the previous post, I talked about Tex Owens, the author of the very famous Cattle Call. Here are different versions of the song, in chronological order. Sorry for the wait, it was quite a long post to write and lots of songs to get, even if I’m sure there are other versions out there, but I find the exercice very interesting ! I hope you do too. And on the personal side, I’m quite busy for the moment with other projects and the weather this Easter weekend was so nice, I enjoyed the sun instead of blogging. This is also a good post to celebrate the one year anniversay of Mademoiselle Montana’s Yodel Heaven ! The song is inspired by cowboy life: the cowboys used cattle calls to let the cattle know where the herders where at night time. Tex Ritter recorded it in 1947. No real yodel but his voice breaks many times. It is a very romantic version with the chorus that prefigures his biggest hit, High Noon. Carolina Cotton made her version around 1951. It was Eddy Arnold‘s performance from 1955 that made the song so popular. His version, accompanied by the Hugo Winterhalter Orchestra, is country but with hints towards pop styles. He recorded the song first in 1944, and then again in 1949 and yet again in 1961. It was used in the movie My own private Idaho. One of the kings of yodel, Slim Whitman recorded the song in 1954. He had been influenced by Eddy Arnold but his falsetto range was a lot better. He made the song more flamboyant and increased the tempo to produce an exciting and wild sound. If I remember good, you can hear the song in Mars Attack, with Indian Love Call. And what about a yodel with a Moog ? Gil Trythall recorded Cattle Call in 1971 with his synthesizer and it works very good ! Around 1986 Boxcar Willie made a version with a playful yodel. 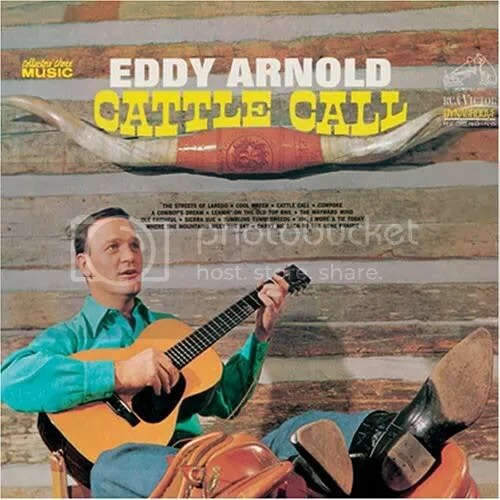 Emmylou Harris tells that the first song she remember hearing on the radio was Cattle Call by Eddie Arnold when she was four years old. She made a live version in 1992. Cowboy singer Skip Gorman has a version on A greener prairie (1994). The same year, Wylie Gustafson made a version with his Wild West group. LeAnn Rimes was 14 when she recorded it in 1996, with Eddy Arnold. A very young voice but such a beautiful yodel ! I haven’t written a lot of posts about yodel in Switzerland, the country where it all began. And this post won’t be about classic yodel or folkloric yodel but about modern and quite experimental yodels. Some singers have decided to push yodel to its frontiers, to innovate, to provoke even: Erika Stucky, Hubert von Goisern, Stimmhorn… and Christine Lauterburg. She caused quite a stir in the nineties with her album Echo der Zeit mixing ambient sounds, electronic beats and yodels. When you listen to it now, it sounds a bit dated, but it was a time of groups like Deep Forrest or Enigma who were mixing world music with synth programming. And Lauterburg’s album is a milestone in Swiss pop music ! Christine Lauterburg was born in 1956 in the region of Bern, Switzerland. As a child, she soon wanted to become a singer. But she first became an actress and played in theater and film in the 1980’s. Once she was 30 years old, she decided to reorientate her career and followed song lessons, where she learned to yodel. She didn’t want to do it in the traditional way but wanted to touch a different public, a younger one. 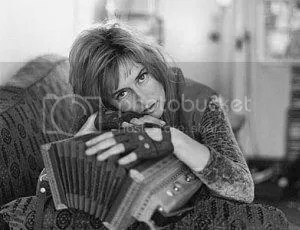 Echo der Zeit was her first album and it went number 9 in the Swiss charts in 1994. The album was produced by Cyrill Schläpfer (the director of the Ur Musig documentary) and by Pascal de Sapio (who is more in a hip hop thing). She looks a bit like of a Nina Hagen from the mountains, a postindustrial Heidi but her music is more techno than punk. Since then, she made other albums, always a bit experimental but less techno, as you can hear on her site. And here is the more traditional side, with songs in duo with Res Margot playing Büchel, a short trumpet-shaped Alphorn in the first one and Schwyzerörgeli in the second one. In Ode to rejection, the yodel sounds melancholic, eerie, mysterious but is also really melodious at the same time. Bliss is a traditional Swiss yodel song, but a strange one. Wait for a post about Erika Stucky and you’ll hear other things in the style. Mouse song is quite funny, with spoken word at the beginning and is also based on a traditional Swiss song. Honey baby blues is a traditional song that was played by Clarence Ashley or Doc Watson. It is in Appalachian old time style, with no yodel but falsetto.